This walkthrough provides a step-by-step explanation of how to use Google Cloud Messaging to implement remote notifications (also called push notifications) in a Xamarin.Android application. It describes the various classes that you must implement to communicate with Google Cloud Messaging (GCM), it explains how to set permissions in the Android Manifest for access to GCM, and it demonstrates end-to-end messaging with a sample test program. 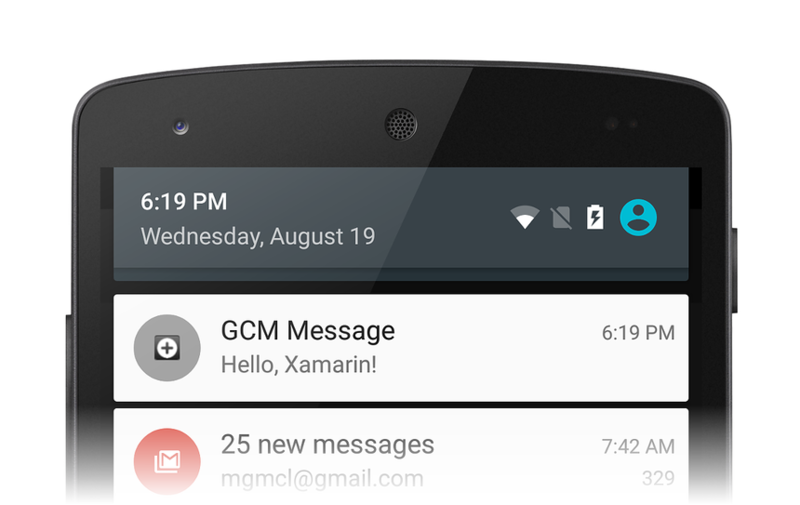 In this walkthrough, we'll create a Xamarin.Android application that uses Google Cloud Messaging (GCM) to implement remote notifications (also known as push notifications). We'll implement the various intent and listener services that use GCM for remote messaging, and we'll test our implementation with a command-line program that simulates an application server. Note that Firebase Cloud Messaging (FCM) is the new version of GCM – Google strongly recommends using FCM rather than GCM. If you are currently using GCM, upgrading to FCM is recommended. For more information about FCM, see Firebase Cloud Messaging. Before you can proceed with this walkthrough, you must acquire the necessary credentials to use Google's GCM servers; this process is explained in Google Cloud Messaging. In particular, you will need an API Key and a Sender ID to insert into the example code presented in this walkthrough. Install additional packages required for communications with GCM servers. Configure app permissions for access to GCM servers. 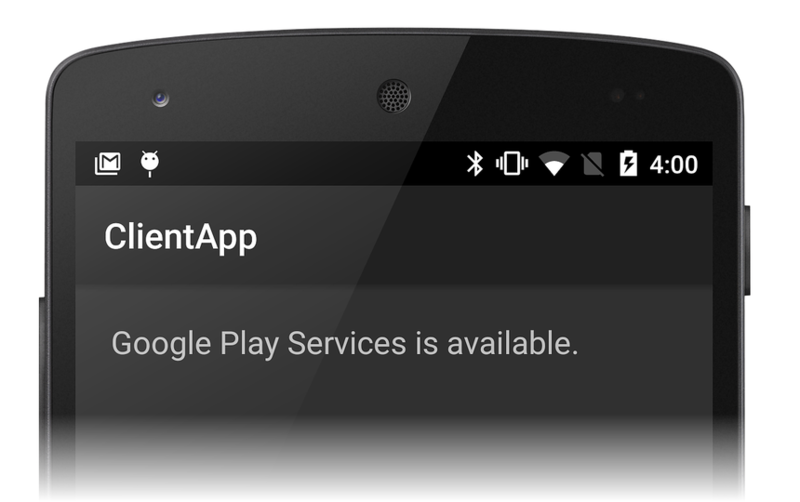 Implement code to check for the presence of Google Play Services. Implement a registration intent service that negotiates with GCM for a registration token. Implement an instance ID listener service that listens for registration token updates from GCM. Implement a GCM listener service that receives remote messages from the app server through GCM. This app will use a new GCM feature known as topic messaging. In topic messaging, the app server sends a message to a topic, rather than to a list of individual devices. Devices that subscribe to that topic can receive topic messages as push notifications. For more information about GCM topic messaging, see Google's Implementing Topic Messaging. When the client app is ready, we'll implement a command-line C# application that sends a push notification to our client app via GCM. To begin, let's create a new empty Solution called RemoteNotifications. Next, let's add a new Android project to this Solution that is based on the Android App template. Let's call this project ClientApp. (If you're not familiar with creating Xamarin.Android projects, see Hello, Android.) The ClientApp project will contain the code for the Xamarin.Android client application that receives remote notifications via GCM. Before we can implement our client app code, we must install several packages that we'll use for communication with GCM. Also, we must add the Google Play Store application to our device if it is not already installed. To receive messages from Google Cloud Messaging, the Google Play Services framework must be present on the device. Without this framework, an Android application cannot receive messages from GCM servers. Google Play Services runs in the background while the Android device is powered on, quietly listening for messages from GCM. When these messages arrive, Google Play Services converts the messages into intents and then broadcasts these intents to applications that have registered for them. When you install Xamarin Google Play Services - GCM, Xamarin Google Play Services - Base is automatically installed. If you get an error, change the project's Minimum Android to target setting to a value other than Compile using SDK version and try the NuGet install again. This makes types in the Google Play Services GMS package available to our code, and it adds logging functionality that we will use to track our transactions with GMS. To receive messages from GCM, the Google Play Store application must be installed on the device. (Whenever a Google Play application is installed on a device, Google Play Store is also installed, so it's likely that it is already installed on your test device.) Without Google Play, an Android application cannot receive messages from GCM. If you do not yet have the Google Play Store app installed on your device, visit the Google Play web site to download and install Google Play. Alternately, you can use an Android emulator running Android 2.2 or later instead of a test device (you do not have to install Google Play Store on an Android emulator). However, if you use an emulator, you must use Wi-Fi to connect to GCM and you must open several ports in your Wi-Fi firewall as explained later in this walkthrough. Note that the client app will be unable to receive a registration token from GCM if this package name does not exactly match the package name that we entered into the Google Developer console. android.permission.WAKE_LOCK – (Optional) Prevents the device CPU from going to sleep while listening for a message. android.permission.INTERNET – Grants internet access so the client app can communicate with GCM. package_name.permission.C2D_MESSAGE – Registers the application with Android and requests permission to exclusively receive all C2D (cloud to device) messages. The package_name prefix is the same as your application ID. In the above XML, change YOUR_PACKAGE_NAME to the package name for your client app project. For example, com.xamarin.gcmexample. For this walkthrough, we're creating a bare-bones app with a single TextView in the UI. This app doesn't directly indicate interaction with GCM. Instead, we'll watch the output window to see how our app handshakes with GCM, and we'll check the notification tray for new notifications as they arrive. Save Main.axml and close it. This code checks the device to see if the Google Play Services APK is installed. If it is not installed, a message is displayed in the message area that instructs the user to download an APK from the Google Play Store (or enable it in the device's system settings). Because we want to run this check when the client app starts, we'll add a call to this method at the end of OnCreate. This code checks for the presence of the Google Play Services APK and writes the result to the message area. If you don't get this result, verify that the Google Play Services APK is installed on your device and that the Xamarin Google Play Services - GCM package is added to your ClientApp project as explained earlier. If you get a build error, try cleaning the Solution and building the project again. Next, we'll write code to contact GCM and get back a registration token. Uses the InstanceID API to generate security tokens that authorize our client app to access the app server. In return, we get back a registration token from GCM. Forwards the registration token to the app server (if the app server requires it). Subscribes to one or more notification topic channels. After we implement this IntentService, we'll test it to see if we get back a registration token from GCM. Now let's take a look at each section of RegistrationIntentService to understand how it works. The RegistrationIntentService constructor names the worker thread RegistrationIntentService to make debugging easier. The core functionality of RegistrationIntentService resides in the OnHandleIntent method. Let's walk through this code to see how it registers our app with GCM. In some cases, the app server does not need the user's registration token; in that case, this method can be omitted. When a registration token is sent to the app server, SendRegistrationToAppServer should maintain a boolean to indicate whether the token has been sent to the server. If this boolean is false, SendRegistrationToAppServer sends the token to the app server – otherwise, the token was already sent to the app server in a previous call. For information about GCM topic messaging on the server side, see Google's Send Messaging to Topics. Registration tokens are unique and secure; however, the client app (or GCM) may need to refresh the registration token in the event of app reinstallation or a security issue. For this reason, we must implement an InstanceIdListenerService that responds to token refresh requests from GCM. The OnTokenRefresh method in our service starts the RegistrationIntentService so that it can intercept the new registration token. The code we have implemented thus far is only "set-up" code; it checks to see if Google Play Services is installed and negotiates with GCM and the app server to prepare our client app for receiving remote notifications. However, we have yet to implement code that actually receives and processes downstream notification messages. To do this, we must implement a GCM Listener Service. This service receives topic messages from the app server and locally broadcasts them as notifications. After we implement this service, we'll create a test program to send messages to GCM so that we can see if our implementation works correctly. Let's first add a small icon that will appear in the notification area when our notification is launched. You can copy this icon to your project or create your own custom icon. We'll name the icon file ic_stat_button_click.png and copy it to the Resources/drawable folder. Remember to use Add > Existing Item ... to include this icon file in your project. Let's take a look at each section of our GcmListenerService to understand how it works. The SendNotification method uses Notification.Builder to create the notification, and then it uses the NotificationManager to launch the notification. Effectively, this converts the remote notification message into a local notification to be presented to the user. For more information about using Notification.Builder and NotificationManager, see Local Notifications. In the above XML, change YOUR_PACKAGE_NAME to the package name for your client app project. In our walkthrough example, the package name is com.xamarin.gcmexample. com.google.android.gms.gcm.GcmReceiver Declares that our app implements a GCM receiver that captures and processes incoming push notification messages. com.google.android.c2dm.permission.SEND Declares that only GCM servers can send messages directly to the app. com.google.android.c2dm.intent.RECEIVE Intent filter advertising that our app handles broadcast messages from GCM. com.google.android.c2dm.intent.REGISTRATION Intent filter advertising that our app handles new registration intents (that is, we have implemented an Instance ID Listener Service). Alternatively, you can decorate GcmListenerService with these attributes rather than specifying them in XML; here we specify them in AndroidManifest.xml so that the code samples are easier to follow. Let's add a C# desktop console application project to the Solution and call it MessageSender. We'll use this console application to simulate an application server – it will send notification messages to ClientApp via GCM. We'll also need to add a reference to System.Net.Http so that we can instantiate an HttpClient for sending our test message to GCM. In the MessageSender project, Right-click References > Add Reference and scroll down until you see System.Net.Http. Put a check mark next to System.Net.Http and click OK. In the above code, change YOUR_API_KEY to the API Key for your client app project. GCM, in turn, forwards this message to your client app. Let's build MessageSender and open a console window where we can run it from the command line. Now we're ready to test our client app. If you're using an emulator or if your device is communicating with GCM over Wi-Fi, you must open the following TCP ports on your firewall for GCM messages to get through: 5228, 5229, and 5230. At this point the client app is ready to receive a remote notification message. From the command line, run the MessageSender.exe program to send a "Hello, Xamarin" notification message to the client app. If you have not yet built the MessageSender project, do so now. Congratulations, your app has received its first remote notification! Note that GCM messages will no longer be received if the app is force-stopped. To resume notifications after a force-stop, the app must be manually restarted. For more information about this Android policy, see Launch controls on stopped applications and this stack overflow post. This walkthrough detailed the steps for implementing remote notifications in a Xamarin.Android application. It described how to install additional packages needed for GCM communications, and it explained how to configure app permissions for access to GCM servers. It provided example code that illustrates how to check for the presence of Google Play Services, how to implement a registration intent service and instance ID listener service that negotiates with GCM for a registration token, and how to implement a GCM listener service that receives and processes remote notification messages. Finally, we implemented a command-line test program to send test notifications to our client app through GCM.